For those who may not be able to eat other Hannakuh treats, these allergy-friendly latkes are a perfect alternative that everyone can enjoy. It is a perfect appetizer, breakfast, or side dish. No one will ever know that you made them without potato. The secret to their success is rest. Once the batter is mixed, it must rest for at least 30 minutes before frying to a light, crispy brown. 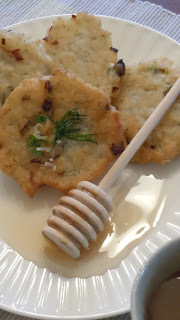 A plate of these latke with a side of honey is a sweet treat for the soul. Serve with honey or my Pear Sauce. After seeing a recent post at wholesomebabyfood.momtastic.com, I just realized that if you omit the green onion or replace it with onion puree, this would be a good 10mo+ finger food!